Although I was a bit older than the target demographic when SpongeBob SquarePants was in its heyday on TV, I did tend to watch it a lot, as it was on my favorite channel at the time–Nickelodeon. I never swore by the show, but I have to admit that it really was funny. And I’ve watched most of the episodes in the first several seasons. But when you take a show that you’re pretty familiar with and used to seeing as 11 or 22 minute story arcs, there’s something in your brain that wants to keep it that way. About 30 minutes into this film you start feeling antsy–even by the slightest languor in the narrative. This is the same issue that The Simpsons Movie had. At a certain point we’re ready for the next story, but an hour in, it’s still the same unresolved issues. Not to mention, television writers are also used to the 11-22 page script–not the 90 page one. They’re filling spaces. Sometimes with dragged out scenes, and sometimes with non sequitur filler jokes (the latter luckily being SpongeBob’s cup of tea anyway). But despite this adversity, the screenwriters do a decent job of mixing in a lot of subplots to keep the audience awake. A lot happens–almost as though there are several 11 minute episodes happening all at once. The only problem lies with the trailer (which I try to avoid watching too many times, but when you go to the movies a lot it’s inevitable). The trailer had us thinking that the whole film was set “out of water”. So the entire time I was anxiously awaiting to see our characters on land in our world. Nonetheless it keeps you laughing if you’re a fan of SpongeBob. A couple of jokes miss, but there’s always one that hits immediately after. It stays true to its original style of irreverence. 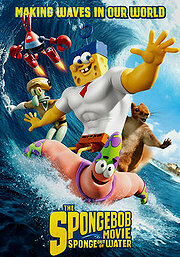 If you aren’t familiar with SpongeBob, you probably won’t like this movie all too much. Fortunately for the people at Nickelodeon, many people (especially 20-30 year olds) like SpongeBob and will want to see this movie. And the younger kids will probably end up dragging their parents to see it anyway–if they don’t already fall into the previous demographic. While they could have done a couple of things slightly better in this movie, it’s a big step forward in the “TV Cartoon on Film” genre and keeps you pretty well entertained.